Windows 8 Enterprise and Professional RTM versions are already leaked for download. There is still no KMS Activation available yet, but now you can remove the Windows 8 Pro build 9200 watermark. It resides at the right bottom corner of Windows 8 desktop. 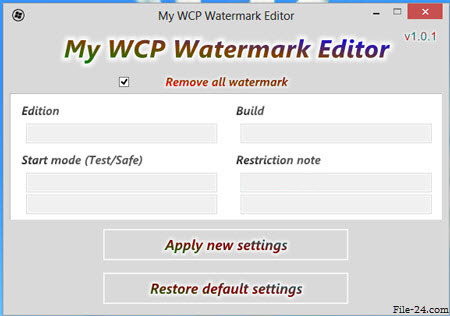 This task can be easily performed with the help of My WCP Watermark Editor. It is a portable tool to edit the predefined message in watermark with a custom one but we can easily use it to remove the entire watermark. So let’s see how we can remove Windows 8 watermark. As I said earlier, Wcp Watermark Editor is very easy to use. Basically there are not many options to shed sweat with if you just want to remove the watermark. Here are the steps you need to go through while being booted into Windows 8. Open the application and check on the Remove all Watermark option. Ignore rest of the settings. Once done click on to Apply New Settings. It also backups current settings, so you can always revert back to original state safely. This will take a while, so do not think that the application stopped responding. I have tested this application with Windows 8 Pro 64 bit, It will also work with the 32 bit version. Note that you can also use this tool to edit the build number and other watermark display message. It not of any real use, except that you can keep your friends wondering.